The Holy Spirit has recently been prompting me to come back to the foundation of our faith, because there are so many things, many voices out there that that can lead us to confusion. That is why you have to remind yourself who you are in Christ Jesus. Many people think that their identity or their value is in what they do, or what they have. Their worth is in their career or the amount of money they possess, or their reputation because those are the standards of the world. We see a generation of young people who, because they don’t know who they are, will identify themselves with famous football player, movie actor…All these things are going to fade away but there is some thing that will remain, which is the word of God, and we, as Christians, were born by this Word. It is the Word that created and sustains every thing that we see (Colossians 1:15-16) and that Word is Jesus Christ himself ,who made himself flesh and made his dwelling among us (John 1:14). So who are we, what is our identity, what is our value,, according to the Word of God? Just take a second and ponder about it. So people of God, let us know who we are in Christ Jesus and walk accordingly, we are not worthless, we have value, we are called children of God, bought with a tremendous price, which is the blood of Jesus. 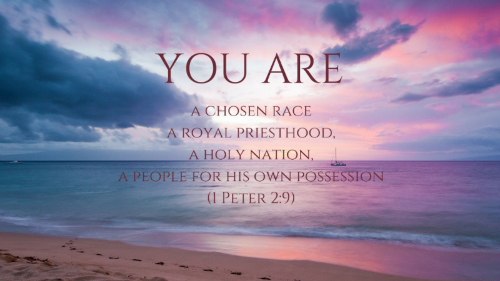 We are a chosen people, a royal priesthood, a holy nation, a people belonging to God (1 Peter 2:9). Next Post LinkEs-tu né de nouveau?